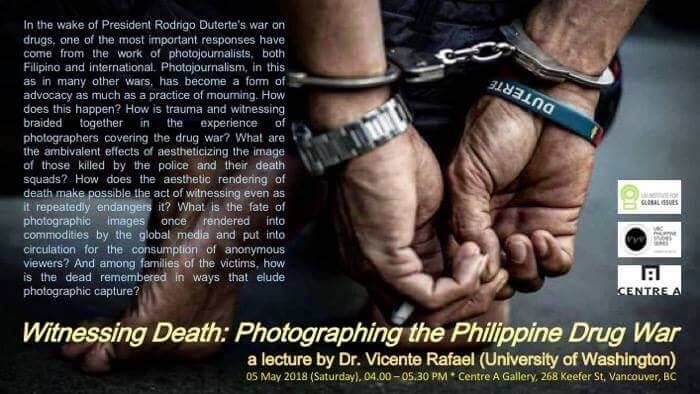 The UBC Philippines Studies Series will be hosting noted Southeast Asianist and historian Vicente Rafael from the University of Washington to give a talk on photojournalism and the politics of witnessing during the Philippine war on drugs. All are welcome to this free talk co-hosted by Center A art center, 268 Keefer St, on Unceded Coast Salish territories. In the wake of President Rodrigo Duterte’s war on drugs, one of the most important responses have come from the work of photojournalists, both Filipino and international. Photojournalism, in this as in many other wars, has become a form of advocacy as much as a practice of mourning. How does this happen? How is trauma and witnessing braided together, for example, in the experience of photographers covering the drug war? What are the ambivalent effects of aestheticizing the image of those killed by the police and their death squads? How does the aesthetic rendering of death make possible the act of witnessing even as it repeatedly endangers it? What is the fate of photographic images once rendered into commodities by the global media and put into circulation for the consumption of anonymous viewers? And among families of the victims, how is the dead remembered in ways that elude photographic capture?